Unleash your inner daredevil with a monster truck experience. With a range of big-wheeled beasts to take control of your heart will be pumping, and your adrenaline will be pumping in no time as you learn to drive these massive monster trucks and crush scrap cars with ease. Get behind the wheel of a monster truck at a number of UK venues. Check out our full range of monster truck driving experiences below. Drive a monster truck, smash your way and demolish, or an off road experience ! Take to the wheel of a real monster truck for yourself. Feel the immense hoursepower at your foot as you tower above the ground on one of our fantastic Monster Truck Driving Experiences. These monster vehicles have unbelievable capabilities and will plough through and over everything in their wake. 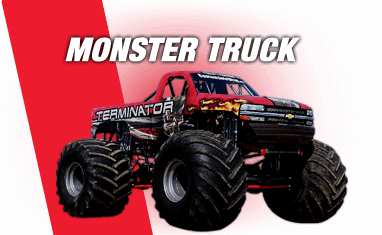 Driving Monster Trucks with the experts is the perfect gift experience for any Monster Truck fan.